Corn and soybeans have been harvested, winter wheat has been planted, and winter is underway in the US. As of the morning of December 6th, about 42.8% of the country was covered in snow with an average depth of about 1.9″. While the Southern Plains and Southeast are largely snow-free at the moment, this is expected to change as a storm moving across the country will bring snow, ice, and rain to these regions over the weekend and possibly into early next week. The Southern Plains will receive their snow on Saturday as the system pushes into the region. Colder than normal temperatures from central Texas northward will allow those in northern Texas, the panhandle, Oklahoma, Arkansas, and parts of Missouri to receive some accumulating snow. Some areas could receive 4-8” of snow, with localized heavier amounts also a possibility. Warmer temperatures in southern Texas and the Gulf states will keep the precipitation falling as rain, although several inches are possible for cities from San Antonio, TX to Jackson, MS. The storm will then set its sights on parts of the Southeast, where much colder than normal temperatures will stick around over the weekend and into next week. While there is still some uncertainty about the exact track and accumulations, this storm does have the potential to bring a foot of snow to parts of North Carolina and Virginia, especially the higher elevations. Accumulations could extend into central North Carolina and even into parts of the Mid-Atlantic depending on the final track. Those further to the south, such as South Carolina and Georgia, will receive rain, generally an inch or two, as the system pushes through. While the south prepares for snow, those in western New York and northwestern PA will be dealing with some lake-effect snow, a common occurrence this time of year. Parts of NY are already receiving snow as of Thursday morning, but some heavier bands are forecast to impact the region later in the day and into the evening. Some areas will continue to see snowfall through Friday morning. Temperatures will trend well below normal over the next few days as well with daytime highs staying below freezing. Overnight lows are expected to fall into the teens. Since November, total snowfall in the US has trended the 6th snowiest in the last 27+ years. National snowfall has been above normal and well above that of last year so far. December monthly snowfall for the US is expected to trend generally close to normal overall, although regions like the Pacific Northwest, Southern Rockies, and Southern Plains are expected to see more snow than last December. 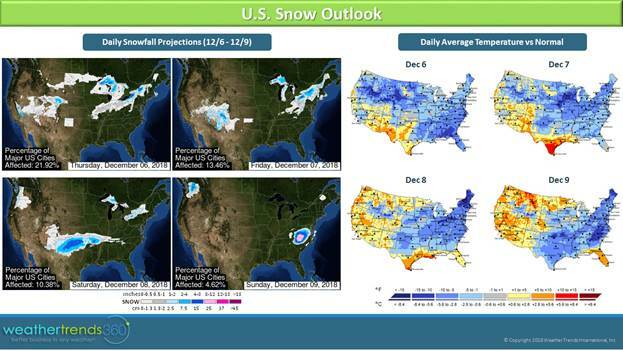 Snowfall trends in the Northeast are expected to trend near to slightly less snowy than last year. While the Northern Rockies will still receive a decent amount of snow for the month, less moisture in the region will ultimately lead to less snow than December 2017.